PeachDish is all about providing adventure in a box. Their recipes are satisfying, homey and exciting all at the same time. 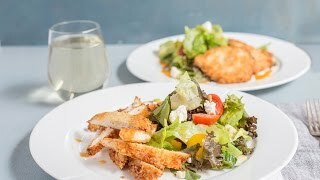 They offer Southern flare, while still creating a menu for the week that is family-friendly and fun to experiment with. All of their recipes are created by classically trained chefs and designed to offer Southern -infused recipes and seasonal ingredients. 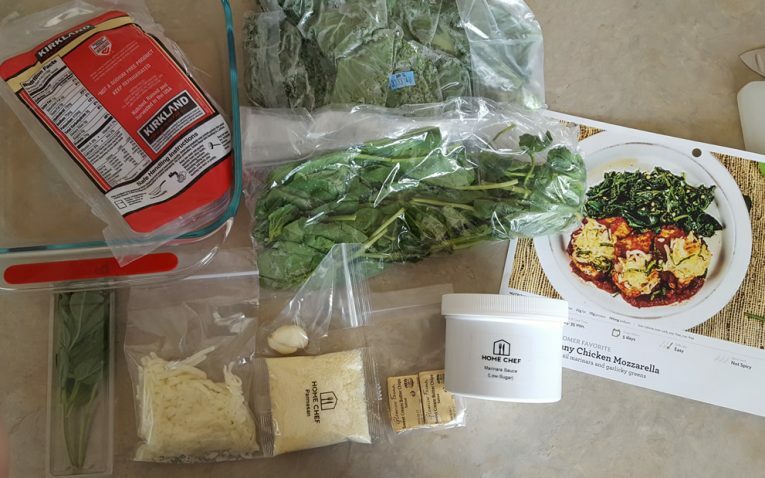 A meal kit delivery service focusing on Southern cuisine and seasonal inspiration. When you set up an account, you can pick how many servings per week you would like and then pick the type of plan you want – including vegetarian, omninvore and pescatarian. 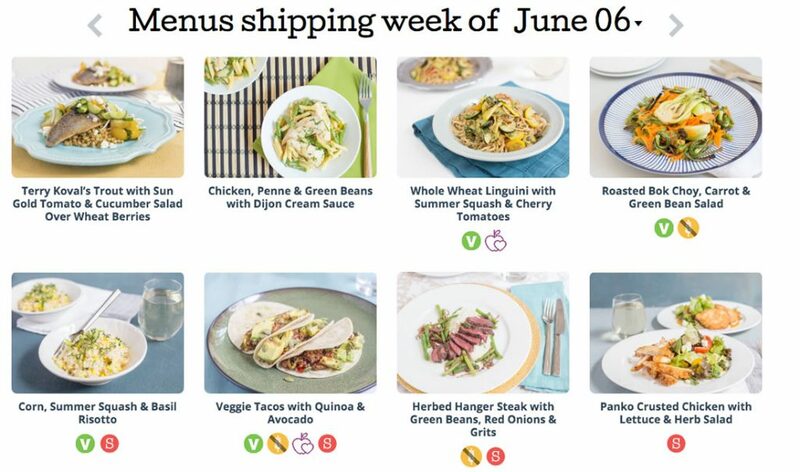 PeachDish tries to simplify the meal kit delivery process, which is why they don’t offer confusing meal options. Instead, there is just one plan, but then you choose how many meals per week and servings you would like from them. Their default is two meals and two servings(4 servings for 2 people – 2 each), but you can increase your meal count and choose as many as 12 servings! 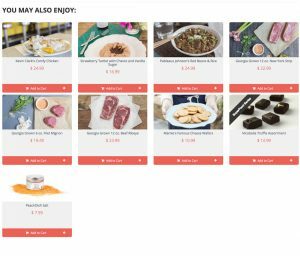 PeachDish has some fun add-ons that you can incorporate into your weekly order, such as desserts, red beans and rice and even truffle assortments. These are paid just as you add them on – and you are not forced to purchase any of them. When you look at the menu options, you are presented with eight meals to choose from. You can see which are vegetarian, gluten-free, meat, fish etc. The meals may not be to everyone's liking – especially if you or your family tend to like more simple, common food choices. If your family have a more meat and potatos type of eating habits, then Peachdish will definitely expand your eating habits with things like quinoa, kale, collard greens, and rutabaga. But if you are looking for more healthy eating options, then they have meals designed specifically with superfoods. 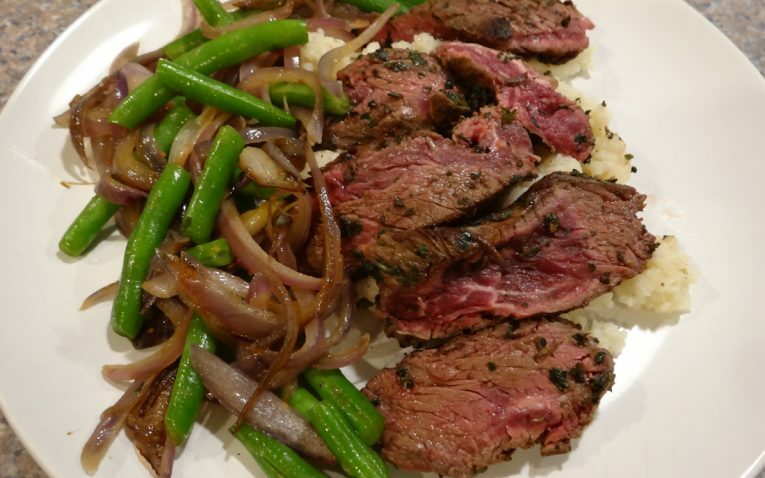 There are no specific Paleo or vegan meals. 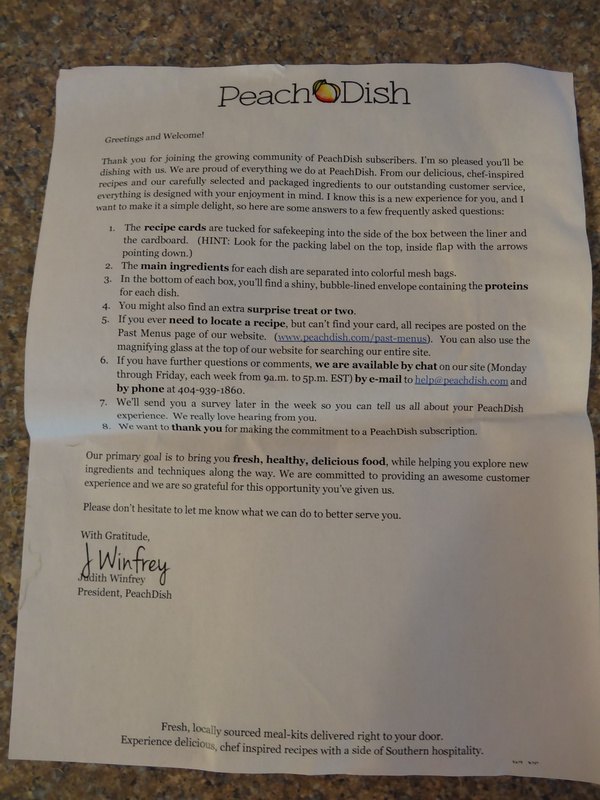 While some meals could apply to those categories, PeachDish makes it clear that they don’t specifically accommodate these dietary needs; therefore, they cannot guarantee a meal is 100% for those types of meal needs. 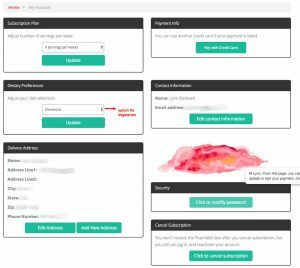 You don’t have to create a subscription right away. 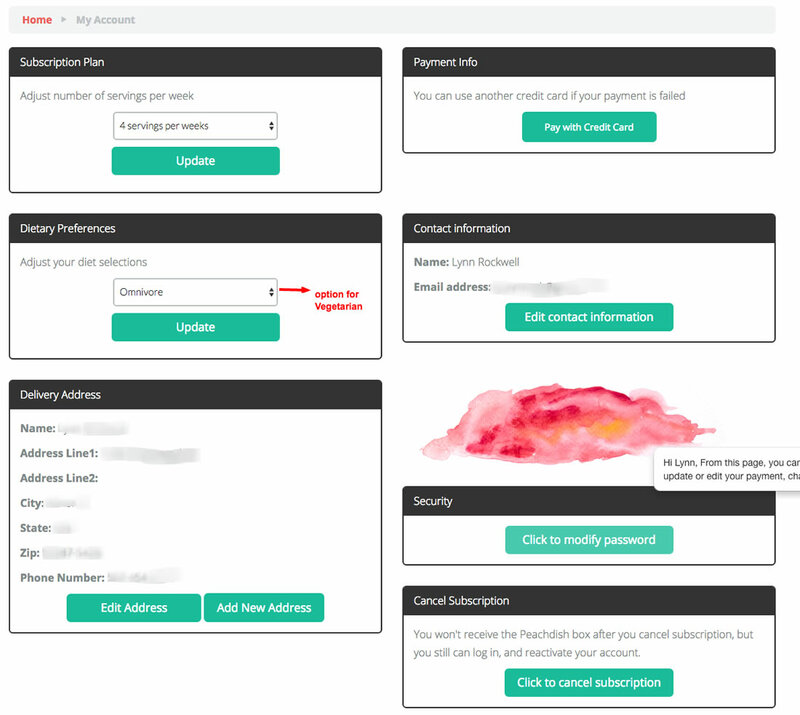 PeachDish lets you sign up with a Guest Box – so you can test it before you’re stuck in a subscription. That being said, PeachDish is extremely flexible. You can alter your account as much as you want – skipping, cancelling, adding servings, etc. You could go from two servings one week to as many as 12 the next week. This is an impressive flexibility that you don’t see with most companies. You can also skip a week if you don't find any of the menu options appealing. 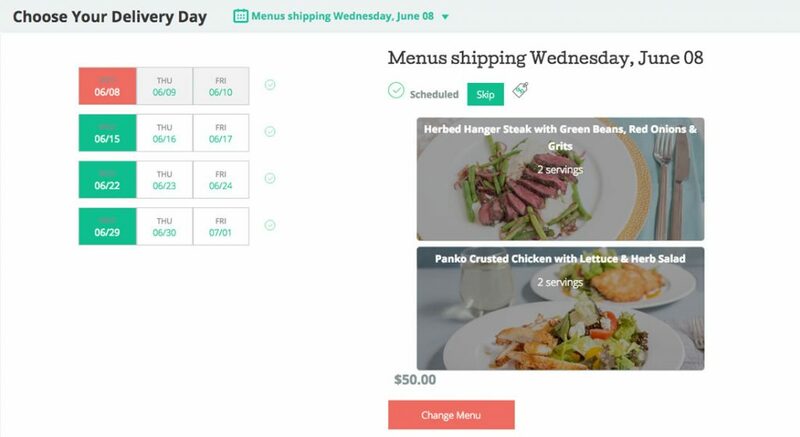 Even better, you can adjust your delivery date quickly and check out your upcoming order all on the same screen – makes it so much easier to manage. We like how they have seasonal rotations, but perhaps adding more to their weekly options would make it easier to order from them on a weekly basis (instead of a monthly basis). PeachDish is a little different with how they work their menu. They have eight menu options to choose from each week – with four changing out seasonally and then four changing out weekly. All of the ingredients are inspired by the South as well as the season. 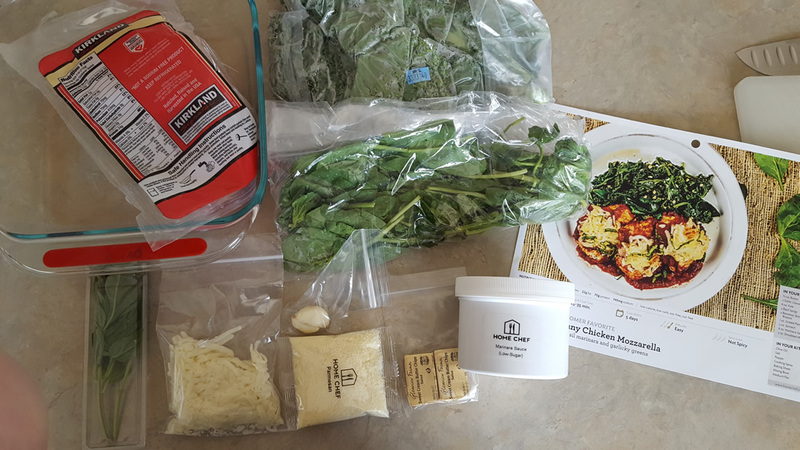 They help you explore traditional flavors, but also unique flavor combinations and ingredients that you would have otherwise never thought about putting together – such as feta cheese and cilantro. In reality, each season you will only have four new dishes to choose from. This may be too limiting for some people. That being said, If you enjoy the seasonal items, you can reorder them on your next box. 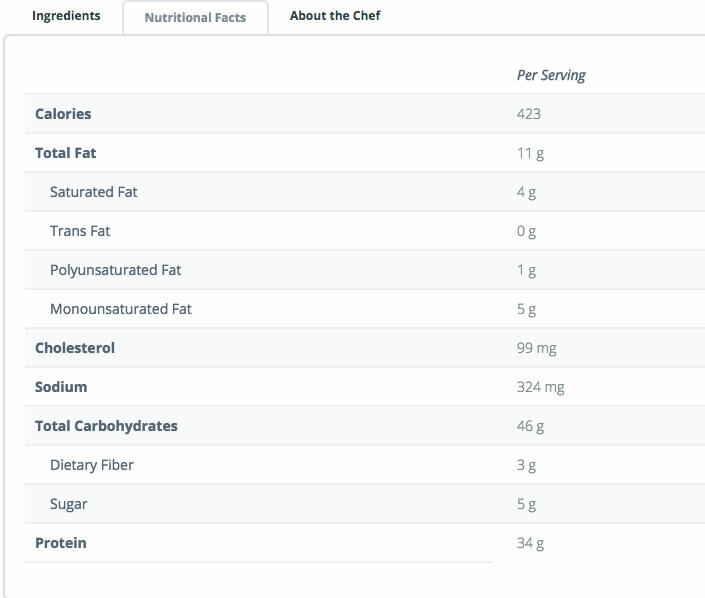 PeachDish goes above and beyond with their nutritional information. 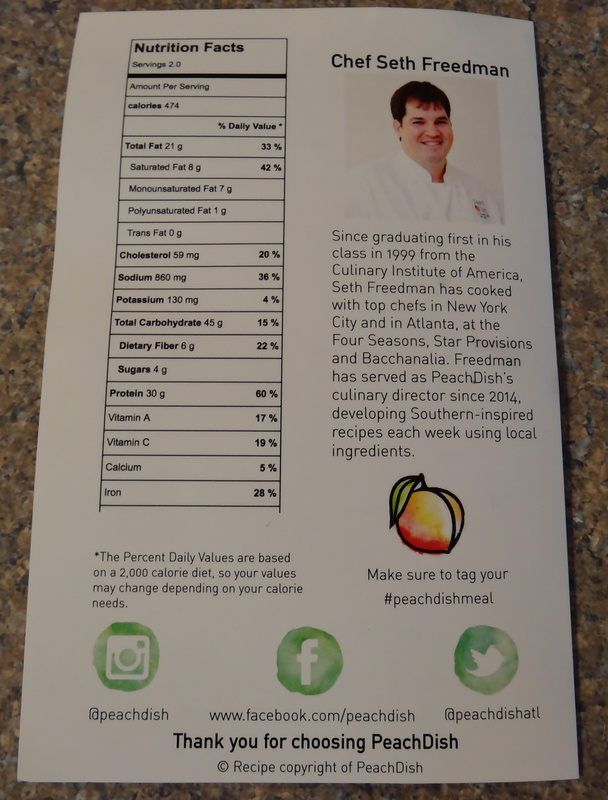 They not only include calories, but they have a full nutrition card on the back of each recipe – including extra information about the chef who designed the meal. Surprisingly, their meals are excellent on calories per serving. All of the ingredients received were at their peak freshness. It was impressive how everything arrived fresh and ready to use. Nothing. The quality of the ingredients received was exceptional. While costlier than other companies, PeachDish seems to have more authentic recipes, quality ingredients and the final result is impressive – and often something you want to eat again. So, in essence, you are definitely getting what you pay for (in a good way). The more you order with PeachDish, the more you save. If you upgrade to a total of eight servings, you can lower your price to $11.25 per serving. 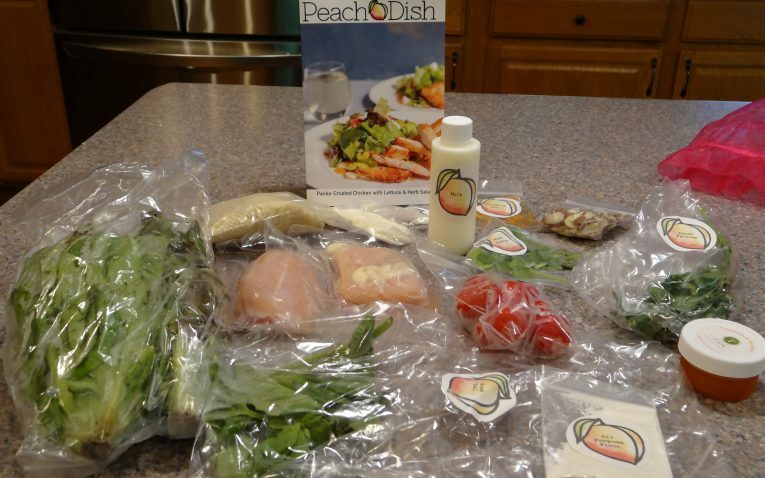 PeachDish is on the more expensive side – averaging $12.50 per serving. Most companies keep it under $10. See how the recipes turned out in my PeachDish Recipe and Food Test blog post. 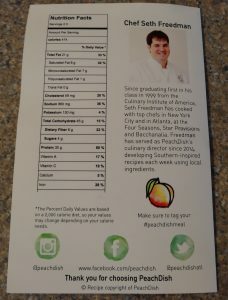 The recipe cards from PeachDish are by far one of the best we’ve seen. They fold open and feature detailed step-by-step instructions and photographs that actually teach you something. They also include all ingredient amounts so that you could recreate the recipe with ease. The portions of each recipe were extremely generous. We ordered two-serving meals, but they were easily split between two people (and could have accommodated a third). There were a few instances where more advanced techniques were not as easy to figure out. For example, the grits we needed to make were not explained as well as they should – such as the texture they should have when done. Everything else, however, was very clear on how to properly prepare. 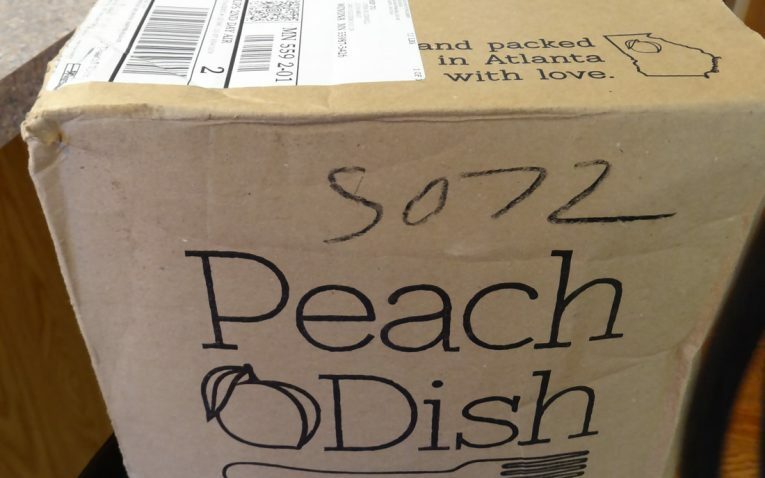 PeachDish boxes arrive clearly marked – so you know who it comes from. 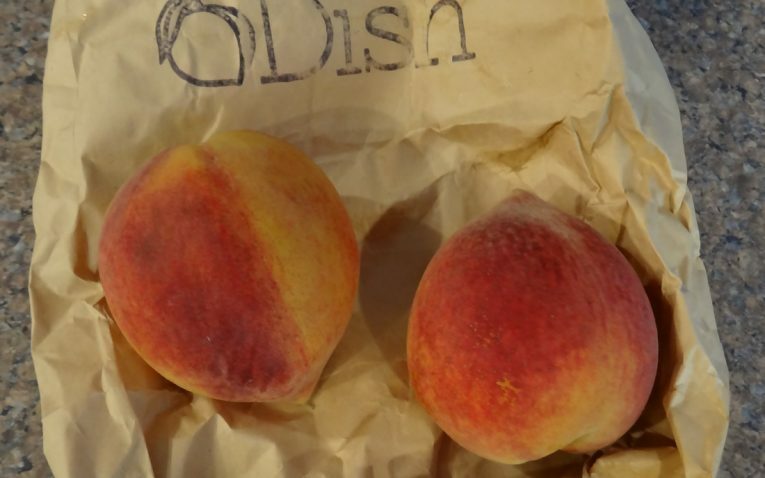 PeachDish uses a jute liner, which is 100 percent recyclable. 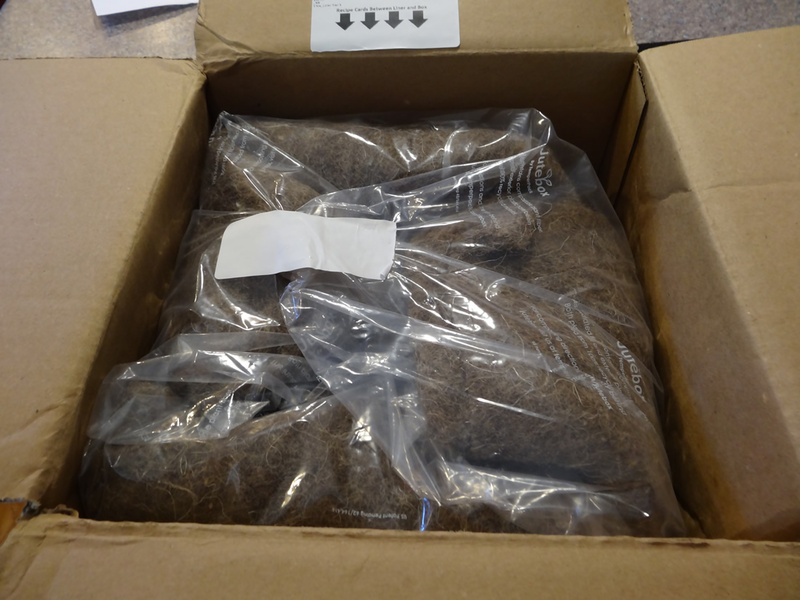 Not all companies use the jute liners, which you can add to your home’s compost pile. So, this is a good feature to point out. 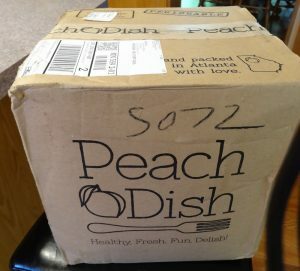 When you open the box, you are greeted by a letter from PeachDish. It discusses where to find your recipe cards (tucked down the side of the box). 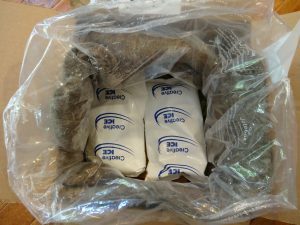 It also discusses the main ingredients and how they are packaged, and how to contact customer service if you were to have any issues. It also contains a list of frequently asked questions, and a hint at a surprise or two you will find in the box as well. 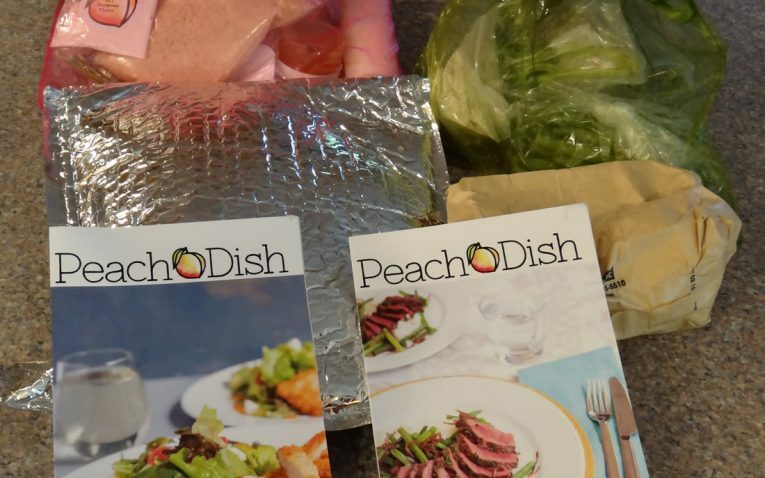 Unlike other companies, who just throw ice packs at the bottom, PeachDish actually puts ice on the top and bottom of the box – ensuring everything is super cold upon arrival. 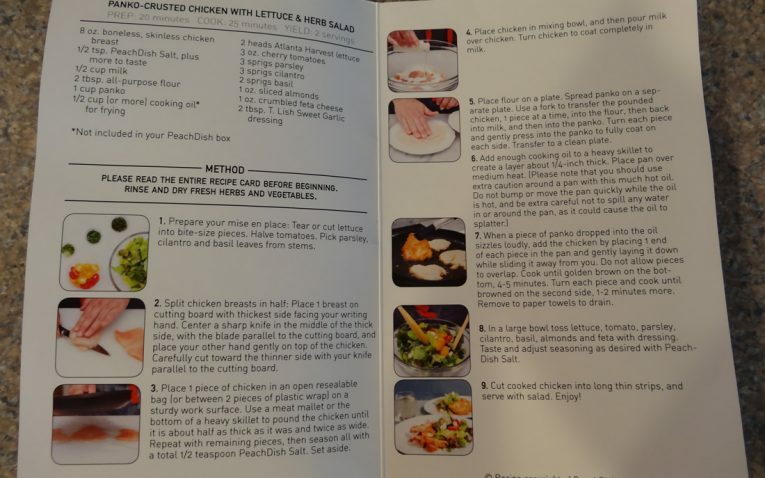 On the inside of one of the box flaps you will find a sticker with arrows pointing down the inside of the box – where you will find your recipe cards. The cards are easy to read and don’t take up a lot of space – so you can easily add them to your home collection. We applaud PeachDish for their extra efforts when it comes to their proteins. 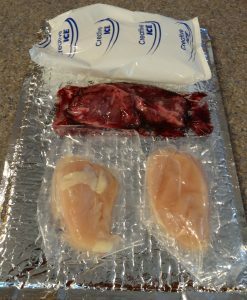 Most companies just haphazardly toss their items in the bottom and don’t take extra care to ensure meats stay cold and sealed. PeachDish doubles up on wrapping their meats, but also has a separate liner and ice pack in the meat section – one of the only companies to do this. This just tells us that they truly value the quality and safety of their food. PeachDish does an excellent job keeping the ingredients separated. 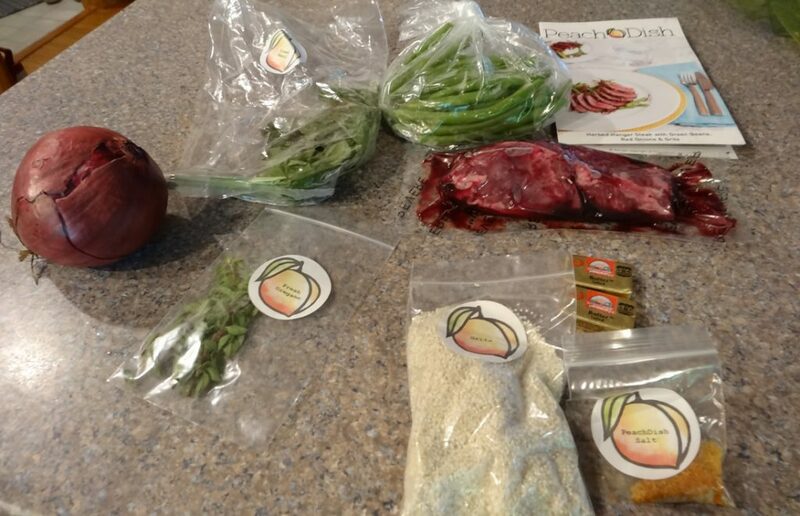 You will have everything you need packaged and labeled in colorful bags – so you can easily differentiate between the meal kits. There were no complaints with packaging here – PeachDish takes extra care and did an excellent job. Shipping is free for most regions, but only if you order $49 or more – which is really easy to do with their pricing. PeachDish does ship during the summer. 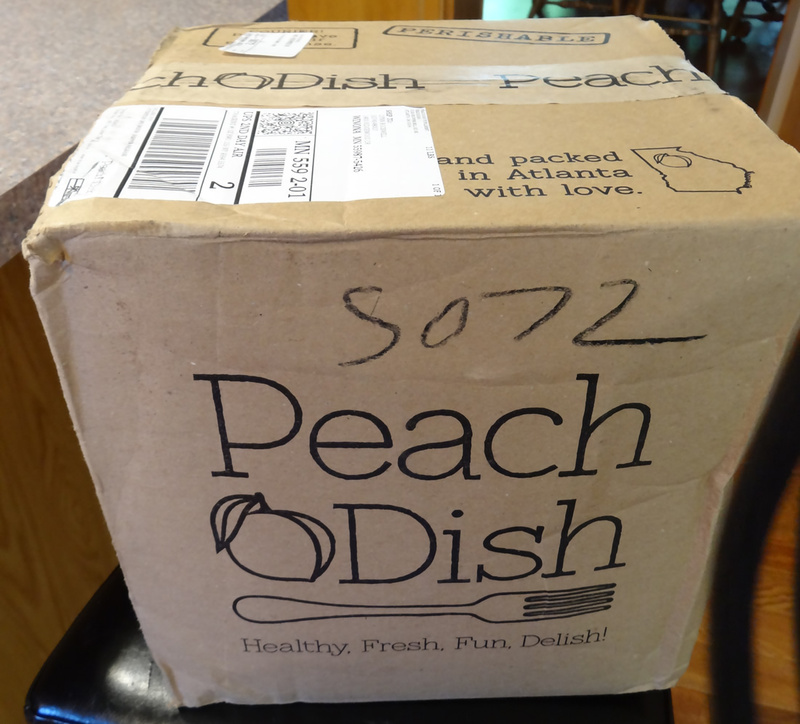 Meals are delivered each week for PeachDish. While they can ship everywhere except Alaska and Hawaii, some states must also pay shipping. Shipping is free for most areas, but if you live in AZ, CA, CO, IA, ID, KS, ME, MN, MT, ND, NE, NM, NV, OK, OR, SD, UT WA, or WY, you will have to pay $15 in shipping. PeachDish allows you to purchase gift cards that are used specifically for a membership. You can also just purchase the membership for someone – and they include the option for wedding gifts. 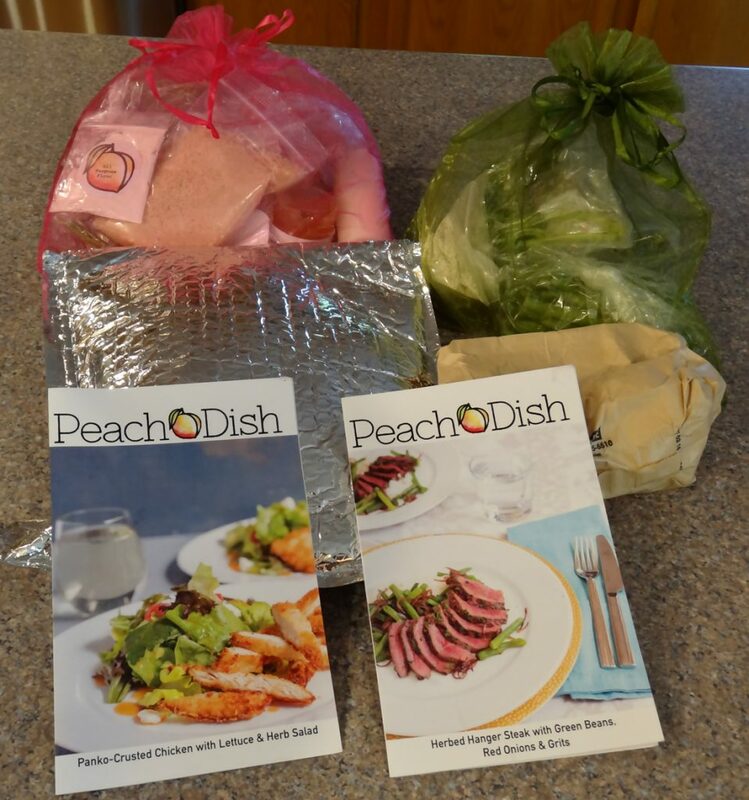 When you purchase a gift from PeachDish, you choose how many weeks, which includes a standard of four servings (which is two dishes for two people or one dish for four). Your recipient will be able to select their serving amounts and they can even adjust up to 12 servings as long as the gift card amount allows. 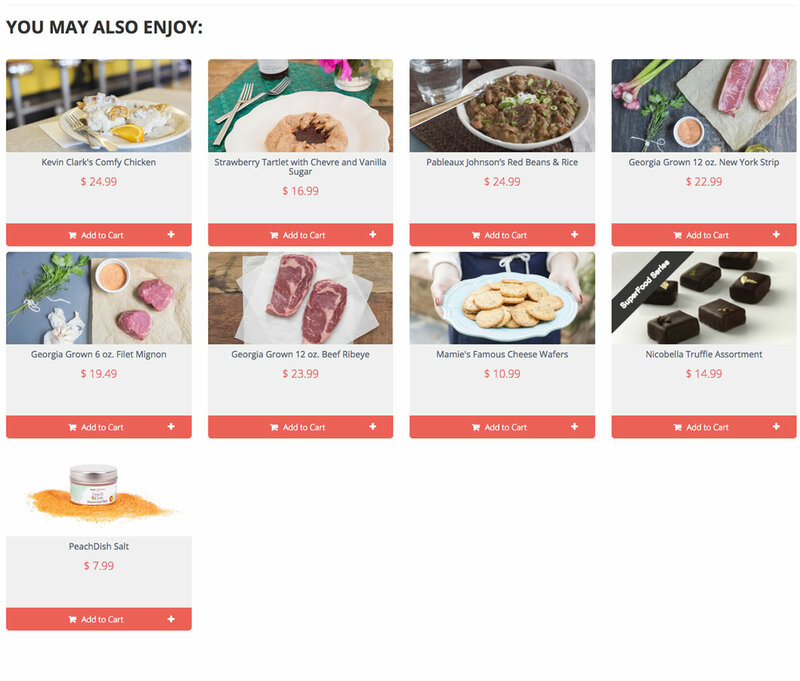 PeachDish lets you choose as many as six months worth of meals and you can customize the gift message as well as when they will be notified of their gift. You can also refer a friend from your account dashboard. By doing so, your friend will receive a $10 off coupon for their first box and you will receive a $10 credit as well just for referring them. Nothing, PeachDish has an excellent gifting option. 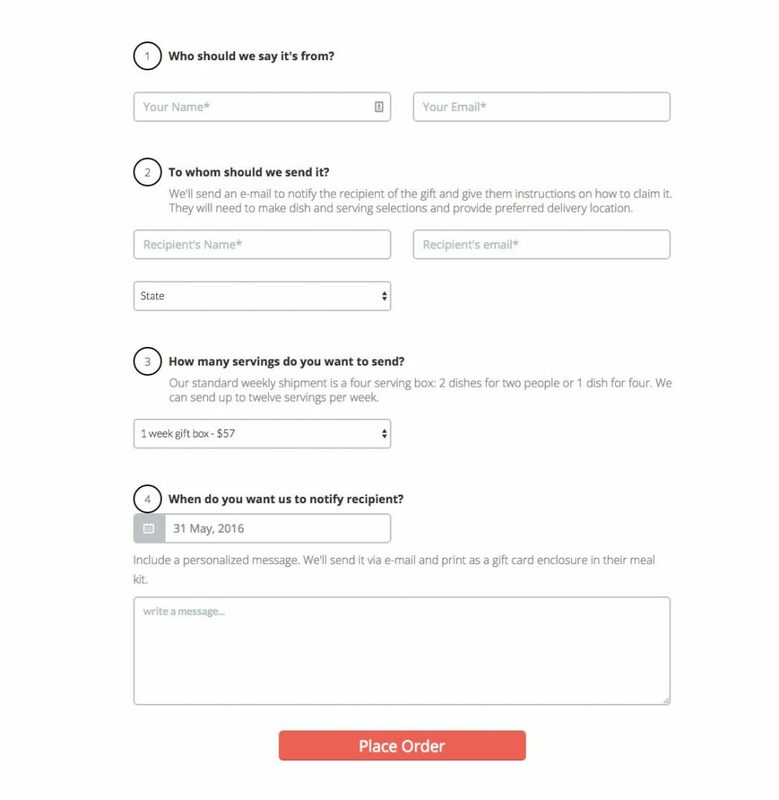 PeachDish is available via chat, email and their local customer support line. You can reach them Monday through Friday from 9am to 5pm EST. PeachDish also has an extensive FAQs section that you can search and find answers to just about anything. If you are dissatisfied or have a quality issue with anything received from PeachDish, they will do what it takes to make it right. Nothing, PeachDish has an excellent customer service options. 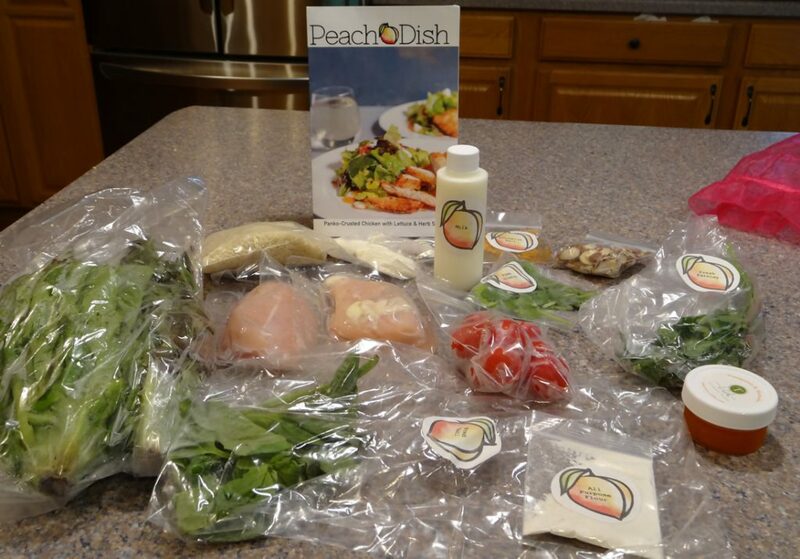 PeachDish charges $12.50 per serving – with discounts going down to $11.25 per serving when you add more servings. Shipping is free to most regions, but will cost $15 for select few. 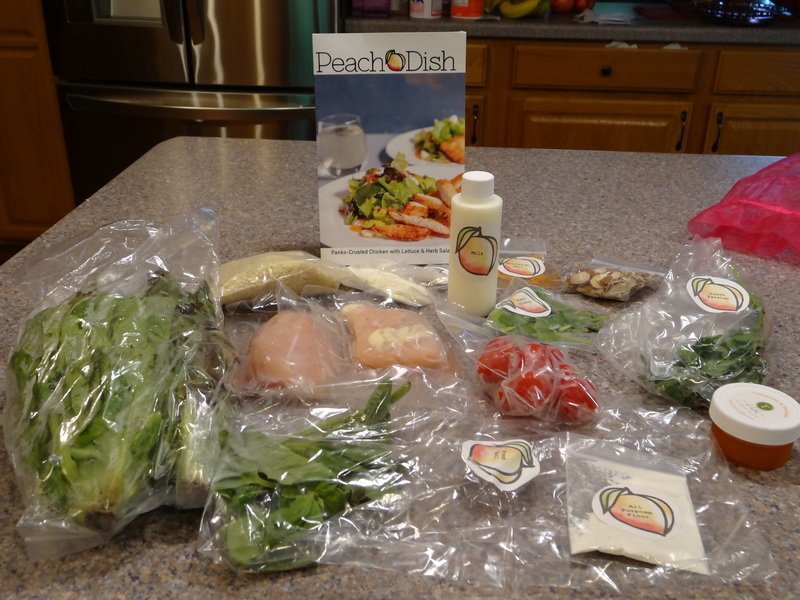 PeachDish is perfect for the novice cook and they are even family-friendly. They break down their recipes so well that you could easily complete them with little to no cooking knowledge. PeachDish works great for couples as well as families. But, because of their higher per price serving, we would say it would be more of a week treat for families than something they could consistently order. 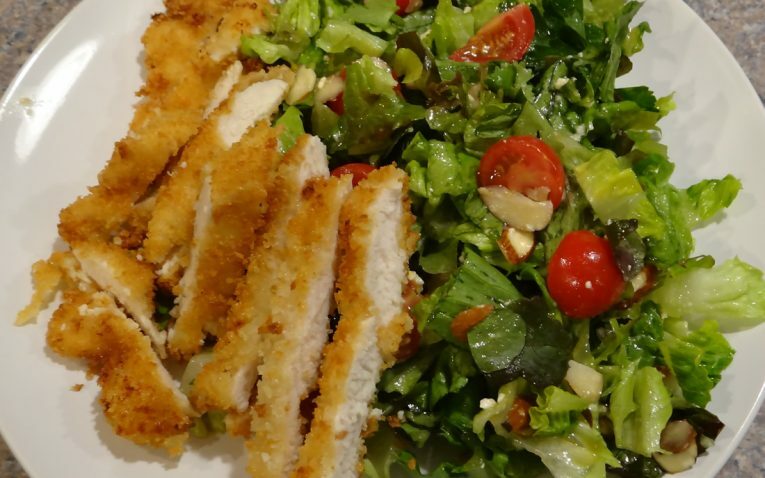 If you are looking for Southern-inspired and seasonal cuisines, PeachDish could be just what you’re craving. 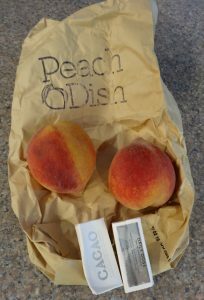 Point Perks: You can earn points for yourself with PeachDish – a fun unique twist. 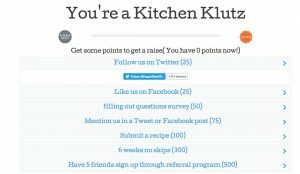 You can like them on Facebook, Twitter, fill out surveys and more. 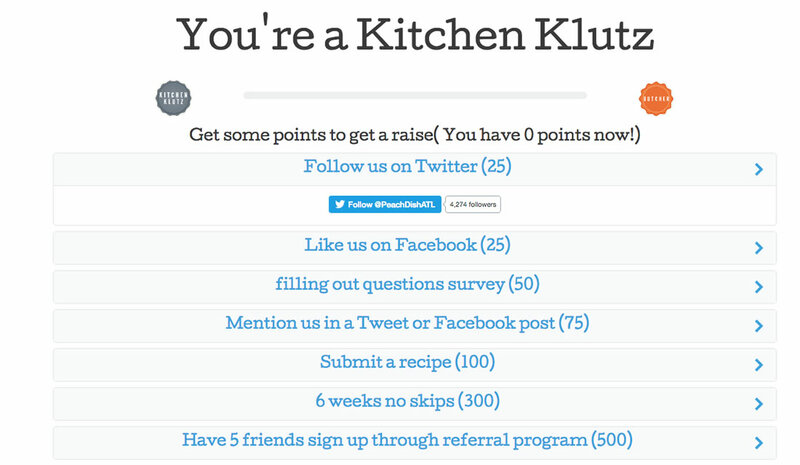 The more points you earn, the more potential you have for free food and gifts from PeachDish. 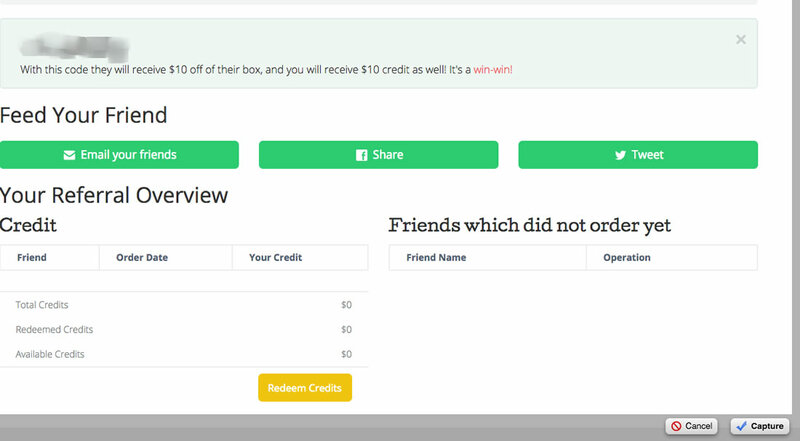 Refer A Friend: You can refer a friend to PeachDish and they will get a $10 credit towards their order and you get a $10 credit towards your next order. 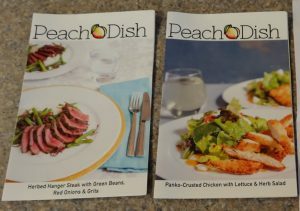 It's a cool program to share your love of PeachDish and get a discount for both you and you friend! A Win-Win! Peaches and Chocolate: PeachDish is truly unique. 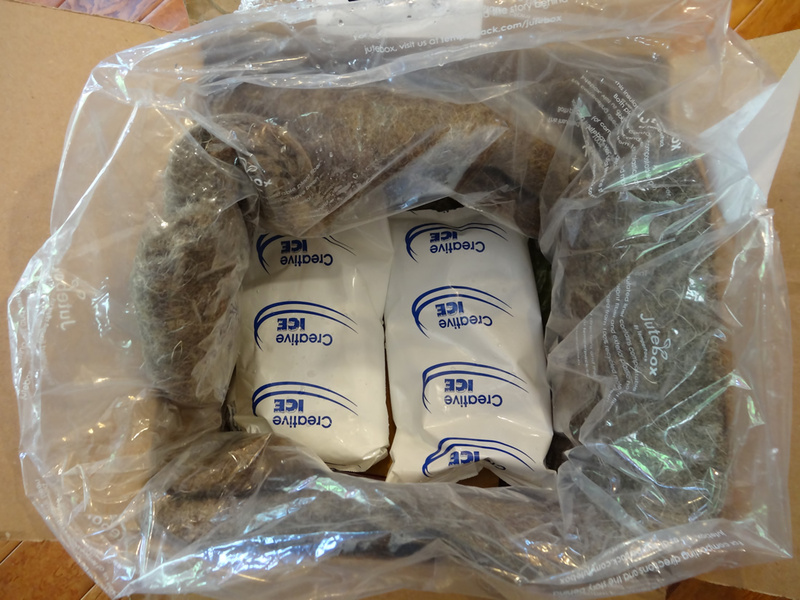 With each shipment they send two peaches and two daily doses of chocolate – it’s a nice added surprise. Colorful Mesh Ingredient Bags: PeachDish separates out all of the ingredients (except the proteins) for each dish in to beautiful colored mesh bags. 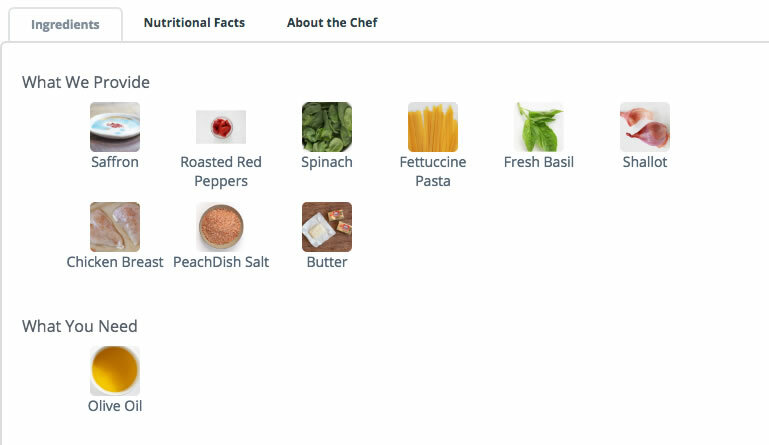 This makes it extremely easy to know what goes with each meal and you can quickly grab it from the refrigerator and start cooking. 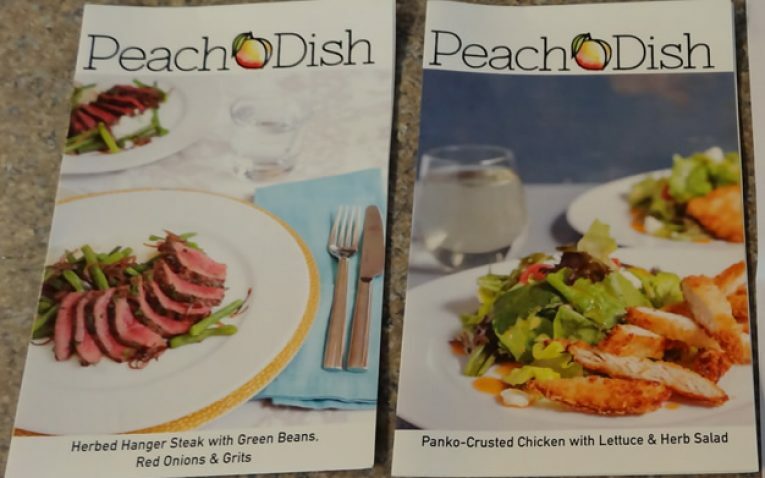 Southern Inspired Meals: Each PeachDish meal is inspired by the flavorful and unique cooking styles of the southern United States. Dishes are flavorful, and filled with fresh ingredients. 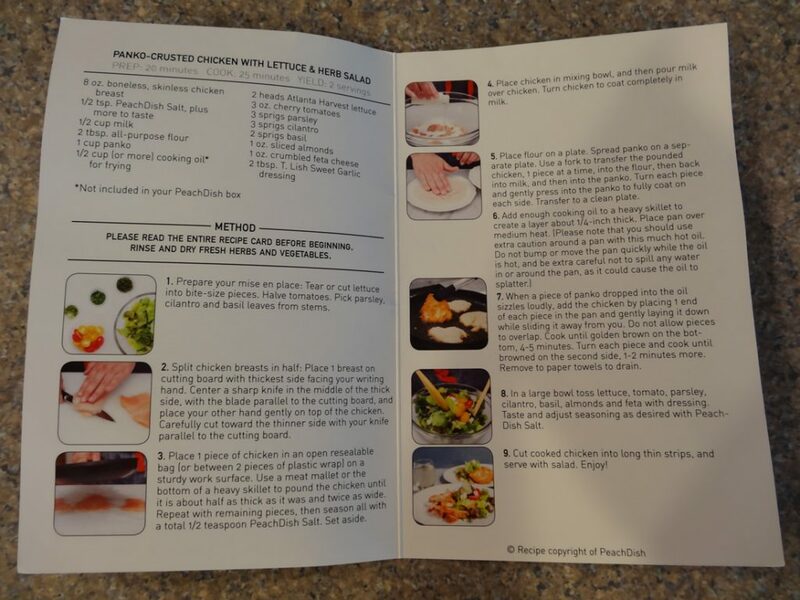 On each recipe card you get a bit of information about the chef that developed that particular recipe as well. Wonderful Add-on Choices: With each meal you have the opportunity to select additional items you may want to pair with the meal. Things like Peach Cobbler, Brownies, or Chocolate Truffles. Who doesn't love a good southern peach cobbler? Or you can select add-ons that you can then make another night – things like traditional southern comfy chicken, or red beans and rice. 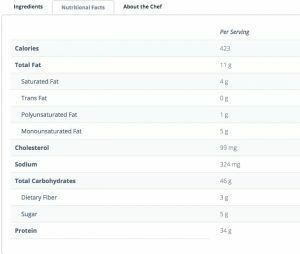 Ingredient and Nutritional Information when Ordering: When you are selecting your meals for a week, you can see a breakdown of all the ingredients that are used in that recipe, as well as a detailed nutritional breakdown. 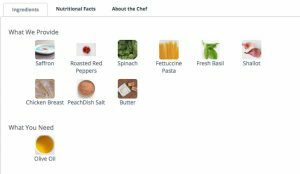 This is extremely helpful for choosing or avoiding recipes for family members with particular dietary restrictions or needs. Seasonal Recipes: Each Week you are presented with 4 rotating menu options and 4 seasonal menu options. So the recipe choices never get old or boring. You can select things like Summer Harvest Rainbow Rolls, Salmon with Cherry Tomatoes and Chard, or Fettuccine with Chicken, Spinach and Saffron. Recipes are bursting with flavor and and freshness. High Shipping Charges: Most companies offer free shipping and those that don’t, keep the shipping charge to less than $10. 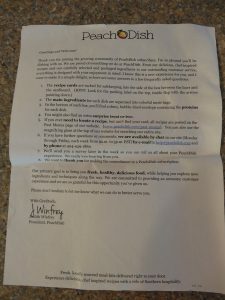 If you live in certain areas of the country (particularly the West Coast), you will pay $15 to ship your PeachDish meals – which can be a little too pricey for some. Only Four Rotating: PeachDish tries to simplify, but at the same time they may hinder their customers when it comes to choices. They have four recipes for the season that do not change (until the seasons change)and then four recipes that rotate weekly. So, while you have 8 recipes to choose from, you really only have four. Overall, PeachDish is extremely impressive. 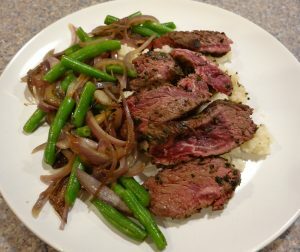 They have excellent recipes, high-quality food and their seasonal as well as Southern-inspired ideas give a unique twist to the classic meal kit delivery service. We highly recommend PeachDish and ourselves were extremely impressed with what they had to offer.